https://sep.yimg.com/ay/yhst-33477391359232/yellow-fiji-leather-sarcophyton-species-yellow-leather-coral-elegant-leather-coral-mushroom-leather-coral-9.jpgYellow Fiji Leather - Sarcophyton species - Yellow Leather Coral - Elegant Leather Coral - Mushroom Leather CoralEasyPeacefulYesIodine, Strontium, Trace elementsTongaAlcyoniidaeSmall 2" - 3"
Yellow Fiji Leather - Sarcophyton species: Yellow Fiji Leather is a great species to begin with. Giving a perfect look and color to your marine aquarium, Yellow Fiji Leather is a must have. Right from the beginners to intermediate aquarists to the experienced ones, Yellow Fiji Leather is desired by all and can be maintained by all across the board. A reef-type marine aquarium of standard size is fine for this very special species, Yellow Fiji Leather. Requiring no exceptional care, Yellow Fiji Leather does give an exceptional look to your marine aquarium. Other names: The Family of Yellow Fiji Leather is Alcyoniidae and the Genus is Sarcophyton. The scientific name of Yellow Fiji Leather is Sarcophyton species. The other common names of Yellow Fiji Leather are Mushroom Coral, Yellow Leather Coral, Toadstool Leather Coral, Elegant Leather Coral, Green Crown Leather and Mushroom Leather Coral. Coral Type: Yellow Fiji Leather is a Soft Coral of Leather type. Origin or natural range: Yellow Fiji Leather originates in the marine water bodies of Fiji and Tonga. Size: Yellow Fiji Leather varies in its size depending upon various factors such as, the marine depth of its occurrence, the water flow around it, the health and growth rate of the Sarcophyton species and the intensity of light to name some. Color: Yellow Fiji Leather is yellow in color. Compatibility: Yellow Fiji Leather is relatively non-aggressive towards the other marine aquarium invertebrates. Morphology: Yellow Fiji Leather has a small stalk and is therefore, near to the rock level. Yellow Fiji Leather gives a frilled look to the rocky edges. 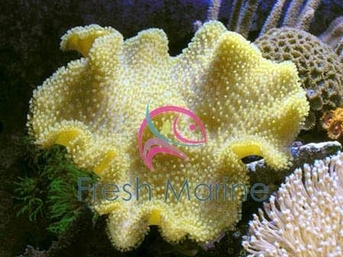 Breeding: Yellow Fiji Leather breeds easily and rapidly in a marine aquarium. Yellow Fiji Leather reproduces asexually by fission. You can mechanically propagate the Sarcophyton species by cutting its crown and loosely attaching each resulting fragment to a rock or sand in your marine aquarium. Each sown fragment then grows to an individual Yellow Fiji Leather. Specific gravity: The specific gravity of your marine aquarium�s water should be 1.023 to 1.025. Care: Yellow Fiji Leather is easy to maintain.